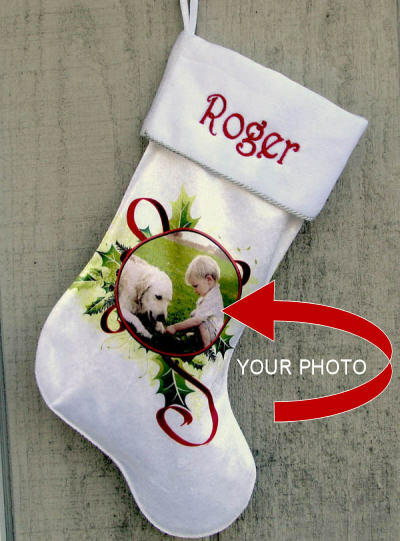 Christmas stocking made out of pristine white velvet is printed with your photo inside out gorgeous holiday ribbon and mistletoe border and then embroidered with a name on the cuff. 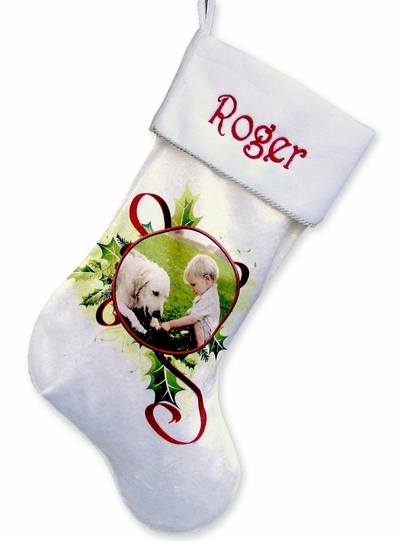 Names can be personalized on the cuff of this Christmas stocking with shimmer embroidery thread to compliment the the shimmer Christmas design. We have a sample picture of the stocking monogrammed with red shimmer embroidery thread ... click on the thumbnail image in the top right hand corner of this page to see a larger version. email us the picture AFTER you place your order! Our store will email you confirmation of your order with the Order Number in the subject line. Reply to the order confirmation and attach your picture to the reply email. Choose a good picture in high resolution - 150 DPI or more, JPG or TIF format - the larger the picture the better! Make sure to provide any special instructions in your email.